Gabrielle "Gabby" Ann Ferraro (baby A) was born first. She was the one who started the day's action when her water broke at around 5:15am. She was on the bottom of the pile and finally decided it was time for everyone to come out. She is our little leader of the pack. I was able to give her a bath and change her 1st diaper last night before holding her for about 45 minutes. 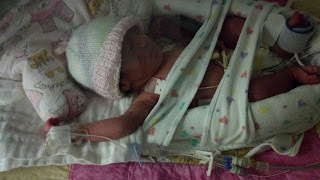 She didn't need any CPAP assistance with breathing and has already started small feedings (2-5 ml per feed - about 1/2 to 1 tsp per feeding). Stats: Gabby was born at 11:01am, weighing 3 lbs, 7 oz and measuring 17 inches.